When it comes to sports marketing, promotional sports bottles are among business owners’ top choices. They tie in well with sports drinks and water companies. Promotional sports bottles with unique design is a great way to get your business to be noticed. These custom water bottles are great as promo gift, or gift with purchase for any sporting event. With events like the FIFA World Cup, it’s a great opportunity to showcase your brand with these cool products. There are many different styles available in the market. But this one is unique and truly amazing. The bottle can be collapsed and folded due to the grooves on the body. These are made of 100% silicone and comes with a PP Lid. It has a capacity of 450 mL. Why is it an effective promotional strategy? Stylish – aside from the fact that the materials used are guaranteed safe, its unique style can be very enticing to the customers. You can add your logo and branding on the grooves. It also comes in different colors perfect for a wide range of demographics. Designs and shades of the bottles may vary depending on your brand color or logos. Beneficial – it is very useful to customers because they can still use it for storing cold beverage long after the event is over. They can bring them to the gym or use it for outdoor activities such as fishing, camping, and hiking. Remarkable -it’s a cost-effective promotional strategy. By putting your logo on the promotional sports bottles, more people will come to know your brand. 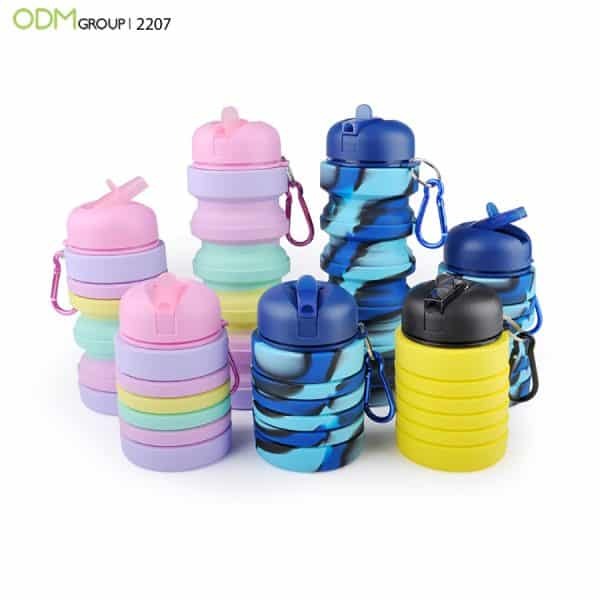 It’s durable so you can be sure that your branded water bottles will last for years. It will make a long-lasting impression on people so your business will always be remembered for its great service and superb promo products. Do you want to learn more about creating effective promotional products that deliver great results? ODM can help you. CONTACT US and reference product code 2207 to get a quote. This custom water bottle phone holder is one of our personal favorites from recent trade shows. Looking for new sports promo product idea? What better way to boost your marketing campaign than using these 2 in 1 custom water bottles?